that Message that his enemies were stirred to redouble their attacks upon him. Unable, hitherto, to disgrace him in the eyes of the government and the people, they now endeavoured to denounce him as an advocate of heresy and a repudiator of all that is sacred and cherished in Islam. "His reputation for justice, for piety, wisdom, and learning," they whispered to one another, "has been such as to render it impossible for us to shake his position. When summoned to Tihran, in the presence of Muhammad Shah was he not able, by his magnetic eloquence, to win him over to his side, and make of him one of his devoted admirers? Now, however, that he has so openly championed the cause of the Siyyid-i-Bab, we can surely succeed in obtaining from the government the order for his arrest and banishment from our town." They accordingly drew up a petition to Muhammad Shah, in which they sought, by every device their malevolent and crafty minds could invent, to discredit his name. "While still professing himself a follower of our Faith," they complained, "he, by the aid of his disciples, was able to repudiate our authority. Now that he has identified himself with the cause of the Siyyid-i-Bab and won over to that hateful creed two-thirds of the inhabitants of Zanjan, what humiliation will he not inflict upon us! The concourse that throngs his gates, the whole masjid can no longer contain. Such is his influence that the masjid that belonged to his father and the one that has been built in his honour, have been connected and made into one edifice in order to accommodate the ever-increasing multitude that hastens eagerly to follow his lead in prayer. The time is fast approaching when not only Zanjan but the neighbouring villages also will have declared themselves his supporters." His arrival at Zanjan was the signal for a fierce outburst on the part of his humiliated opponents. As the evidences of their hostility multiplied, the marks of devotion on the part of his friends and supporters correspondingly increased. (2) Utterly disdainful of their machinations, he pursued his activities with unrelaxing zeal. (3) The liberal principles which he unceasingly and fearlessly advocated struck at the very root of the fabric which a bigoted enemy had laboriously reared. They beheld with impotent fury the disruption of their authority and the collapse of their institutions. Zanjan and delivered into his hands, while he was addressing his disciples, a sealed letter from his Beloved. In the Tablet he received, the Bab conferred upon him one of His own titles, that of Hujjat, and urged him to proclaim from the pulpit, without the least reservation, the fundamental teachings of His Faith. No sooner was he informed of the wishes of his Master than he declared his resolve to devote himself to the immediate enforcement of whatever injunction that Tablet contained. He immediately dismissed his disciples, bade them close their books, and declared his intention of discontinuing his courses of study. "Of what profit," he said, "are study and research to those who have already found the Truth, and why strive after learning when He who is the Object of all knowledge is made manifest?" As soon as he attempted to lead the congregation in offering the Friday prayer, enjoined upon him by the Bab,(1) the Imam-Jum'ih, who had hitherto performed that duty, vehemently protested, on the ground that this right was the exclusive privilege of his own forefathers, that it had been conferred upon him by his sovereign, and that no one, however exalted his station, could usurp it. "That right," Hujjat retorted, "has been superseded by the authority with which the Qa'im Himself has invested me. I have been commanded by Him to assume that function publicly, and I cannot allow any person to trespass upon that right. If attacked, I will take steps to defend myself and to protect the lives of my companions." of recognised institutions and trampled upon their rights. "We must either flee from this town with our families and belongings," they pleaded, "and leave him in sole charge of the destinies of its people, or obtain from Muhammad Shah an edict for his immediate expulsion from this country; for we firmly believe that to allow him to remain on its soil would be courting disaster." Though Haji Mirza Aqasi, in his heart, distrusted the ecclesiastical order of his country and had a natural aversion to their beliefs and practices, he was forced eventually to yield to their pressing demands, and submitted the matter to Muhammad Shah, who ordered the transfer of Hujjat from Zanjan to the capital. A Kurd named Qilij Khan was commissioned by the Shah to deliver the royal summons to Hujjat. 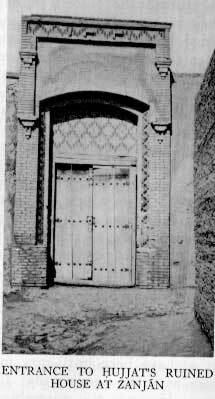 The Bab had meanwhile arrived in the neighbourhood of Tihran on His way to Tabriz. Ere the arrival of the royal messenger at Zanjan, Hujjat had sent one of his friends, a certain Khan-Muhammad-i-Tub-Chi, to his Master with a petition in which he begged to be allowed to rescue Him from the hands of the enemy. The Bab assured him that His deliverance the Almighty alone could achieve and that no one could escape from His decree or evade His law. "As to your meeting with Me," He added, "it soon will take place in the world beyond, the home of unfading glory." 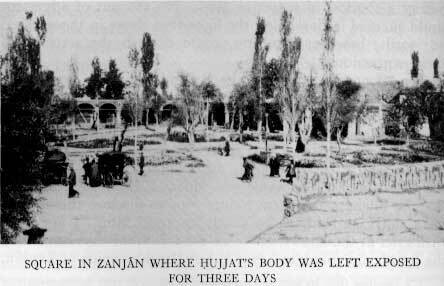 The day Hujjat received that message, Qilij Khan arrived at Zanjan, acquainted him with the orders he had received, and set out, accompanied by him, for the capital. Their arrival at Tihran coincided with the Bab's departure from the village of Kulayn, where He had been detained for some days. deliver Him from His captivity. He even directed them to tell the believers among their fellow-townsmen not to press round Him, but even to avoid Him wherever He went. No sooner had that message been delivered to those who had gone out to welcome Him on His approach to their town than they began to grieve and deplore their fate. They could not, however, resist the impulse that drove them to march forth to meet Him, forgetful of the desire He had expressed. between Muhammad Big-i-Chaparchi and his colleague, who had been despatched from Tihran to assist in conducting the Bab to Tabriz. Muhammad Big insisted that their Prisoner should be taken into the town, where He should be allowed to pass the night in the caravanserai of Mirza Ma'sum-i-Tabib, the father of Mirza Muhammad-'Aliy-i-Tabib, a martyr of the Faith, before resuming their march to Adhirbayjan. He pleaded that to pass the night outside the gate would be to expose their lives to danger, and would encourage their opponents to attempt an attack upon them. He eventually succeeded in convincing his colleague that he should conduct the Bab to that caravanserai. As they were passing through the streets, they were amazed to see the multitude that had crowded onto the housetops in their eagerness to catch a glimpse of the face of the Prisoner. 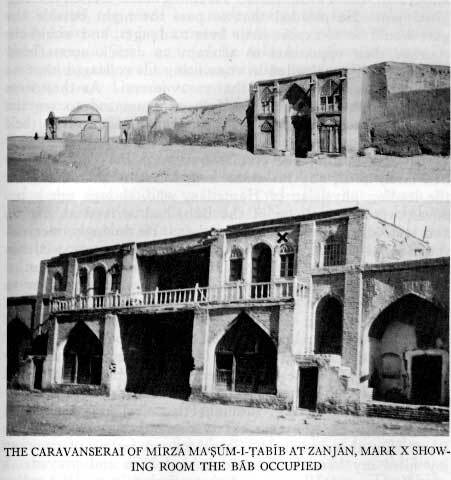 Mirza Ma'sum, the former owner of the caravanserai, had lately died, and his eldest son, Mirza Muhammad-'Ali, the leading physician of Hamadan, who, though not a believer, was a true lover of the Bab, had arrived at Zanjan and was in mourning for his father. He lovingly received the Bab in the caravanserai he had specially prepared beforehand for His reception. That night he remained until a late hour in His presence and was completely won over to His Cause. of sunrise, as He mounted His horse and was preparing to depart, I begged to be allowed to follow Him, but He advised me to remain, and assured me of His unfailing prayers. Resigning myself to His will, with regret I watched Him disappear from my sight." On his arrival at Tihran, Hujjat was conducted into the presence of Haji Mirza Aqasi; who, on behalf of the Shah and himself, expressed his annoyance at the intense hostility which his conduct had aroused among the ulamas of Zanjan. "Muhammad Shah and I," he told him, "are continually besieged by the oral as well as written denunciations brought against you. I could scarcely believe their indictment relating to your desertion of the Faith of your forefathers. Nor is the Shah inclined to credit such assertions. I have been commanded by him to summon you to his capital and to call upon you to refute such accusations. It grieves me to hear that a man whom I consider infinitely superior in knowledge and ability to the Siyyid-i-Bab has chosen to identify himself with his creed." "Not so," replied Hujjat; "God knows that if that same Siyyid were to entrust me with the meanest service in His household, I would deem it an honour such as the highest favours of my sovereign could never hope to surpass." "This can never be!" burst forth Haji Mirza Aqasi. "It is my firm and unalterable conviction," Hujjat reaffirmed, "that this Siyyid of Shiraz is the very One whose advent you yourself, with all the peoples of the world, are eagerly awaiting. He is our Lord, our promised Deliverer. Haji Mirza Aqasi reported the matter to Muhammad Shah, to whom he expressed his fears that to allow so formidable an adversary, whom the sovereign himself believed to be the most accomplished of the ulamas of his realm, to pursue unhindered the course of his activities would be a policy fraught with gravest danger to the State. The Shah, disinclined to credit such reports, which he attributed to the malice and envy of the enemies of the accused, ordered that a special meeting be convened at which he should be asked to vindicate his position in the presence of the assembled ulamas of the capital. of which Hujjat eloquently set forth the basic claims of his Faith and confounded the arguments of those who tried to oppose him. "Is not the following tradition," he boldly declared, "recognised alike by shi'ah and sunni Islam: `I leave amidst you my twin testimonies, the Book of God and my family'? Has not the second of these testimonies, in your opinion, passed away, and is not our sole means of guidance, as a result, contained in the testimony of the sacred Book? I appeal to you to measure every claim that either of us shall advance, by the standard established in that Book, and to regard it as the supreme authority whereby the righteousness of our argument can be judged." Unable to defend their case against him, they, as a last resort, ventured to ask him to produce a miracle whereby to establish the truth of his assertion. "What greater miracle," he exclaimed, "than that He should have enabled me to triumph, alone and unaided, by the simple power of my argument, over the combined forces of the mujtahids and ulamas of Tihran?" The masterly manner in which Hujjat refuted the unsound claims advanced by his adversaries won for him the favour of his sovereign, who from that day forth was no longer swayed by the insinuations of his enemies. Although the entire company of the ulamas of Zanjan, as well as a number of the ecclesiastical leaders of Tihran, had declared him to be an infidel and condemned him to death, yet Muhammad Shah continued to bestow his favours upon him and to assure him that he could rely on his support. Haji Mirza Aqasi, though at heart unfriendly to Hujjat, was unable, in the face of such unmistakable evidences of royal favour, to resist his influence openly, and by his frequent visits to his house, and by the gifts he lavished upon him, that deceitful minister sought to conceal his resentment and envy. sent to investigate His Cause. He enumerated a series of observances, some of which constituted a definite departure from the established traditions of Islam. "Siyyid Kazim-i-Zanjani," he assured them, "has been intimately connected with my Master both in Shiraz and in Isfahan. He, as well as Mulla Iskandar and Mashhadi Ahmad, both of whom I sent to meet Him, have positively declared that He Himself is the first to practise the observances He has enjoined upon the faithful. It therefore behoves us who are His supporters to follow His noble example." These explicit instructions were no sooner read to his companions than they became inflamed with an irresistible desire to carry out his wishes. They enthusiastically set to work to enforce the laws of the new Dispensation, and, giving up their former customs and practices, unhesitatingly identified themselves with its claims. Even the little children were encouraged to follow scrupulously the admonitions of the Bab. "Our beloved Master," they were taught to say, "Himself is the first to practise them. Why should we who are His privileged disciples hesitate to make them the ruling principles of our lives?" Hujjat was still a captive in Tihran when the news of the siege of the fort of Tabarsi reached him. He longed, and deplored his inability, to throw in his lot with those of his companions who were struggling with such splendid heroism for the emancipation of their Faith. His sole consolation in those days was his close association with Baha'u'llah, from whom he received the sustaining power that enabled him, in the time to come, to distinguish himself by deeds no less remarkable than those which that company had manifested in the darkest hours of their memorable struggle. leave Tihran in disguise and join his companions, who eagerly awaited his return. His arrival at his native town, which a certain Karbila'i Vali-'Attar announced to his companions, was a signal for a tremendous demonstration of devoted loyalty on the part of his many admirers. They flocked out, men, women, and children, to welcome him and to renew their assurances of abiding and undiminished affection. (1) The governor of Zanjan, Majdu'd-Dawlih,(2) the maternal uncle of Nasiri'd-Din Shah, astounded by the spontaneity of that ovation, ordered, in the fury of his despair, that the tongue of Karbila'i Vali-'Attar be immediately cut out. Though at heart he loathed Hujjat, he pretended to be his friend and well-wisher. He often visited him and showed him unbounded consideration, yet he was secretly conspiring against his life and was waiting for the moment when he could strike the fatal blow. by the believers to the governor, in order to induce him to release his young prisoner. He refused their offer, whereupon they complained to Hujjat, who vehemently protested. "That child," he wrote to the governor, "is too young to be held responsible for his behaviour. If he deserves punishment, his father and not he should be made to suffer." Finding that the appeal had been ignored, he renewed his protest and entrusted it to the hands of one of his influential comrades, Mir Jalil, father of Siyyid Ashraf and martyr of the Faith, directing him to present it in person to the governor. The guards stationed at the entrance of the house at first refused him admittance. Indignant at their refusal, he threatened to force his way through the gate, and succeeded, by the mere threat of unsheathing his sword, in overcoming their resistance and in compelling the infuriated governor to release the child. The unconditional compliance of the governor with the demand of Mir Jalil stirred the furious indignation of the ulamas. They violently protested, and deprecated his submission to the threats with which their opponents had sought to intimidate him. They expressed to him their fear that such a surrender on his part would encourage them to make still greater demands upon him, would enable them before long to assume the reins of authority and to exclude him from any share in the administration of the government. They eventually induced him to consent to the arrest of Hujjat, an act which they were convinced would succeed in checking the progress of his influence. The governor reluctantly consented. He was repeatedly assured by the ulamas that his action would under no circumstances endanger the peace and security of the town. Two of their supporters, Pahlavan(1) Asadu'llah and Pahlavan Safar-'Ali, both notorious for their brutality and prodigious strength, volunteered to seize Hujjat and deliver him hand-cuffed to the governor. Each was promised a handsome reward in return for this service. Clad in their amour, with helmets on their heads, and followed by a band of ruffians recruited from among the most degraded of the population. they set out to accomplish their purpose. The ulamas were in the meantime busily engaged in inciting the populace and encouraging them to reinforce their efforts. The cry which that stout-hearted defender of the Faith raised on that day was heard for the first time in Zanjan, a cry that spread panic through the town. The governor was terrified by its tremendous force, and asked what that shout could mean and whose voice had been able to raise it. He was gravely shaken when told that it was the watchword of Hujjat's companions, with which they called for the assistance of the Qa'im in the hour of distress. The remnants of that affrighted band encountered, shortly after, Shaykh Muhammad-i-Tub-Chi, whom they immediately recognised as one of their ablest adversaries. Finding him unarmed, they fell upon him and, with an axe one of them was carrying, struck him and broke his head. They bore him to the governor, and no sooner had they laid down the wounded man than a certain Siyyid Abu'l-Qasim, one of the mujtahids of Zanjan who was present, leaped forward and, with his penknife, stabbed him in the breast. The governor too, unsheathing his sword, struck him on the mouth and was followed by the attendants who, with the weapons they carried with them, completed the murder of their hapless victim. As their blows rained upon him, unmindful of his sufferings, he was heard to say: "I thank Thee, O my God, for having vouchsafed me the crown of martyrdom." He was the first among the believers of Zanjan to lay down his life in the path of the Cause. His death, which occurred on Friday, the fourth of Rajab, in the year 1266 A.H.,(1) preceded by forty-five days the martyrdom of Vahid and by fifty-five days that of the Bab. The blood that was shed on that day, far from allaying the hostility of the enemy, served further to inflame their passions, and to reinforce their determination to subject to the same fate the rest of the companions. Encouraged by the governor's tacit approval of their expressed intentions, they resolved to put to death all upon whom they could lay their hands, without obtaining beforehand an express authorisation from the government officials. They solemnly covenanted among themselves not to rest until they had extinguished the fire of what they deemed a shameless heresy. (2) They compelled the governor to bid a crier proclaim throughout Zanjan that whoever was willing to endanger his life, to forfeit his property, and expose his wife and children to misery and shame, should throw in his lot with Hujjat and his companions; and that those desirous of ensuring the well-being and honour of themselves and their families, should withdraw from the neighbourhood in which those companions resided and seek the shelter of the sovereign's protection. opponents, sought the presence of Hujjat and urged him, as a precautionary measure, to transfer his residence to the fort of Ali-Mardan Khan,(1) adjacent to the quarter in which he was residing. Hujjat gave his consent and ordered that their women and children, together with such provisions as they might require, be taken to the fort. Though they found it occupied by its owners, the companions eventually induced them to withdraw, and gave them in exchange the houses in which they themselves had been dwelling. The enemy was meanwhile preparing for a violent attack upon them. No sooner had a detachment of their forces opened fire upon the barricades the companions had raised than Mir Rida, a siyyid of exceptional courage, asked his leader to allow him to attempt to capture the governor and to bring him as a prisoner to the fort. Hujjat, unwilling to comply with his request, advised him not to risk his life. set out, as evidence of his earnestness, to launch an offensive against the occupants of the fort. He had no sooner given the signal for attack and advanced at the head of a band of thirty of his comrades, than he unexpectedly encountered two of his adversaries who were marching with drawn swords towards him. Believing that they intended to assail him, he, with the whole of his band, was suddenly seized with panic, straightway regained his home, and, forgetful of the assurances he had given to the governor, remained the whole day closeted within his room. Those who were with him promptly dispersed, renouncing the thought of pursuing the attack. They were subsequently informed that the two men they had encountered had no hostile intention against them, but were simply on their way to fulfil a commission with which they had been entrusted. That humiliating episode was soon followed by a number of similar attempts on the part of the supporters of the governor, all of which utterly failed to achieve their purpose. Every time they rushed to attack the fort, Hujjat would order a few of his companions, who were three thousand in number, to emerge from their retreat and scatter their forces. He never failed, every time he gave them such orders, to caution his fellow-disciples against shedding unnecessarily the blood of their assailants. He constantly reminded them that their action was of a purely defensive character, and that their sole purpose was to preserve inviolate the security of their women and children. "We are commanded," he was frequently heard to observe, "not to wage holy war under any circumstances against the unbelievers, whatever be their attitude towards us." Amir-Nizam reached one of the generals of the imperial army, Sadru'd-Dawliy-i-Isfahani by name,(1) who had set out at the head of two regiments for Adhirbayjan. The written orders of the Grand Vazir reached him in Khamsih, bidding him cancel his projected journey and proceed immediately to Zanjan and there give his assistance to the forces that had been mustered by the government. "You have been commissioned by your sovereign," the Amir-Nizam wrote him, "to subjugate the band of mischief-makers in and around Zanjan. It is your privilege to crush their hopes and exterminate their forces. So signal a service, at so critical a moment, will win for you the Shah's highest favour, no less than the applause and esteem of his people." contest raged in the environs of the fort three days and three nights, in the course of which the besieged, under the direction of Hujjat, resisted with splendid daring the fierce onslaught of their assailants. Neither their overwhelming numbers nor the superiority of their equipment and training could enable them to reduce the intrepid companions to an unconditional surrender. (1) Undeterred by the fire of the cannon with which they were deluged, and forgetful of both sleep and hunger, they rushed in a headlong charge out of the fort, utterly unmindful of the perils incurred by such a sally. To the imprecations with which an opposing host greeted their appearance from their retreat, they shouted their answer of "Ya Sahibu'z-Zaman!" and, carried away by the spell which that invocation threw upon them, hurled themselves upon the enemy and scattered his forces. The frequency and success of these sallies demoralised their assailants and convinced them of the futility of their efforts. They were soon compelled to acknowledge their powerlessness to win a decisive victory. Sadru'd-Dawlih himself had to confess that after the lapse of nine months of sustained fighting, all the men who had originally belonged to his two regiments, no more than thirty crippled soldiers were left to support him. Filled with humiliation, he was forced, eventually, to admit his powerlessness to daunt the spirit of his opponents. He was degraded from his rank and gravely reprimanded by his sovereign. The hopes he had fondly cherished were, as the result of that defeat, irretrievably shattered. So abject a defeat struck dismay into the hearts of the people of Zanjan. Few were willing, after that disaster, to risk their lives in hopeless encounters. Only those who were compelled to fight ventured to renew their attacks upon the besieged. The brunt of the struggle was mainly borne by the regiments which were being successively despatched from Tihran for that purpose. While the inhabitants of the town, and particularly the merchant class among them, profited greatly by the sudden influx of such a large number of forces, the companions of Hujjat suffered want and privation within the walls of the fort. Their supplies dwindled rapidly; their only hope of receiving any food from outside lay in the efforts, often unsuccessful, of a few women who could manage, under various pretexts, to approach the fort and sell them at an exorbitant price the provisions they so sadly needed. Though oppressed with hunger and harassed by fierce and sudden onsets, they maintained with unflinching determination the defence of the fort. Sustained by a hope that no amount of adversity could dim, they succeeded in erecting no less than twenty-eight barricades, each of which was entrusted to the care of a group of nineteen of their fellow-disciples. At each barricade, nineteen additional companions were stationed as sentinels, whose function it was to watch and report the movements of the enemy. They were frequently surprised by the voice of the crier whom the enemy sent to the neighbourhood of the fort to induce its occupants to desert Hujjat and his Cause. "The governor of the province," he would proclaim, "and the commander-in-chief too, are willing to forgive and extend a safe passage to whoever among you will decide to leave the fort and renounce his faith. Such a man will be amply rewarded by his sovereign, who, in addition to lavishing gifts upon him, will invest him with the dignity of noble rank. Both the Shah and his representatives have pledged their honour not to depart from the promise they have given." To this call the besieged would, with one voice, return contemptuous and decisive replies. in her lot with the band of women and children who had joined the defenders of the fort. Her name was Zaynab, her home a tiny hamlet in the near neighbourhood of Zanjan. She was comely and fair of face, was fired with a lofty faith, and endowed with intrepid courage. The sight of the trials and hardships which her men companions were made to endure stirred in her an irrepressible yearning to disguise herself in male attire and share in repulsing the repeated attacks of the enemy. Donning a tunic and wearing a head-dress like those of her men companions, she cut off her locks, girt on a sword, and, seizing a musket and a shield, introduced herself into their ranks. No one suspected her of being a maid when she leaped forward to take her place behind the barricade. As soon as the enemy charged, she bared her sword and, raising the cry of "Ya Sahibu'z-Zaman!" flung herself with incredible audacity upon the forces arrayed against her. Friend and foe marvelled that day at a courage and resourcefulness the equal of which their eyes had scarcely ever beheld. Her enemies pronounced her the curse which an angry Providence had hurled upon them. Overwhelmed with despair and abandoning their barricades, they fled in disgraceful rout before her. from me that inestimable privilege, the crown of martyrdom, the one desire of my life." Hujjat was profoundly impressed by the tone and manner of her appeal. He sought to calm the tumult of her soul, assured her of his prayers in her behalf, and gave her the name Rustam-'Ali as a mark of her noble courage. "This is the Day of Resurrection," he told her, "the day when `all secrets shall be searched out. '(1) Not by their outward appearance, but by the character of their beliefs and the manner of their lives, does God judge His creatures, be they men or women. Though a maiden of tender age and immature experience, you have displayed such vitality and resource as few men could hope to surpass." He granted her request, and warned her not to exceed the bounds their Faith had imposed upon them. "We are called upon to defend our lives," he reminded her, "against a treacherous assailant, and not to wage holy war against him." shrill sound of her voice was sufficient to strike consternation into their hearts and to fill them with despair. One day, seeing that her companions were being suddenly enveloped by the forces of the enemy, Zaynab ran in distress to Hujjat and, flinging herself at his feet, implored him, with tearful eyes, to allow her to rush forth to their aid. "My life, I feel, is nearing its end," she added. "I may myself fall beneath the sword of the assailant. Forgive, I entreat you, my trespasses, and intercede for me with my Master, for whose sake I yearn to lay down my life." Hujjat was too much overcome with emotion to reply. Encouraged by his silence, which she interpreted to mean that he consented to grant her appeal, she leaped out of the gate and, raising seven times the cry "Ya Sahibu'z-Zaman!" rushed to stay the hand that had already slain a number of her companions. "Why befoul by your deeds the fair name of Islam?" she shouted, as she flung herself upon them. "Why flee abjectly from before our face, if you be speakers of truth?" She ran to the barricades which the enemy had erected, routed those who guarded the first three of the defences, and was engaging in overcoming the fourth, when, beneath a shower of bullets, she dropped dead upon the ground. Not a single voice among her opponents dared question her chastity or ignore the sublimity of her faith and the enduring traits of her character. Such was her devotion that after her death no less than twenty women of her acquaintance embraced the Cause of the Bab. To them she had ceased to be the peasant girl they had known; she was the very incarnation of the noblest principles of human conduct, a living embodiment of the spirit which only a Faith such as hers could manifest. defenders of the barricades joined in shouting those words simultaneously. So loud and compelling was that cry that the enemy was rudely awakened from sleep, abandoned the camp in horror, and, hurrying to the environs of the governor's residence, sought shelter in the neighbouring houses. A few were so shocked with terror that they instantly dropped dead. 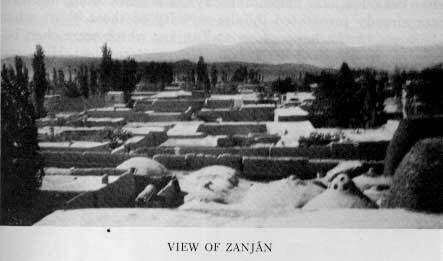 A considerable number of the inhabitants of Zanjan fled, panic-stricken, to the adjoining villages. Many believed that stupendous uproar to be a sign heralding the Day of Judgment; to others it signified the sending forth, on the part of Hujjat, of a fresh summons which they felt would be the prelude to a sudden offensive against them more terrible than any they had yet experienced. "What," Hujjat was heard to remark, when informed of the terror that sudden invocation had inspired, "if I had been permitted by my Master to wage holy war against these cowardly miscreants! I am bidden by Him to instil into men's hearts the ennobling principles of charity and love, and to refrain from all unnecessary violence. My aim and that of my companions is, and ever will be, to serve our sovereign loyally and to be the well-wishers of his people. Had I chosen to follow in the footsteps of the ulamas of Zanjan, I should, as long as I live, have continued to remain the object of the slavish adoration of this people. Never shall I be willing to barter for all the treasures and honours this world can give me, the undying loyalty I bear His Cause." pealed out than the dissolute officers, who were holding their wine-glasses in their hands, dropped them instantly to the ground and rushed out headlong, in bare feet, as if stunned by that stentorian outcry. Gambling tables were overturned in the midst of the disorder that ensued. Half dressed and bareheaded, a number ran out into the wilderness, while others betook themselves in haste to the homes of the ulamas and roused them from their sleep. Alarmed and overawed, these began to direct their fiercest invectives against one another for having kindled the fire of such great mischief. As soon as the enemy had discovered the purpose of that loud clamour, they returned to their posts, reassured, though greatly humiliated, by their experience. The officers directed a certain number of their men to lie in ambush and to fire in any direction from which those voices might again proceed. Every night they succeeded in this way in slaying a number of the companions. Undeterred by the losses they were repeatedly sustaining, Hujjat's supporters continued to raise, with undiminished fervour, their invocation, despising the perils which the offering of the prayer involved. As their number diminished, that prayer grew louder and acquired added poignancy. Even the imminence of death was powerless to induce the intrepid defenders of the fort to give up what they deemed the noblest and most powerful reminder of their Beloved. extinguishing the fire which the mischief-makers had kindled. Though free to return to my home, I preferred to remain in the capital, wholly relying upon the justice of my sovereign. In the early days of your reign, the Amir-Nizam, while the Mazindaran upheaval was still in progress, suspected me of treason and determined to destroy my life. Finding no one in Tihran able to protect me, I determined, in self-defence to flee to Zanjan, where I resumed my labours and strove with all my might to advance the true interest of Islam. I was pursuing my work when Majdu'd-Dawlih arose against me. I several times appealed to him to exercise moderation and justice, but he refused to grant my request. Instigated by the ulamas of Zanjan, and encouraged by the adulation they lavished upon him, he determined to arrest me. My friends intervened and attempted to stay his hand. He continued to rouse the people against me, and they in their turn have acted in a manner that has led to the present situation. Your Majesty has until now refrained from extending his gracious assistance to us, who are the innocent victims of such ferocious cruelty. Our enemies have even sought to represent our Cause, in the eyes of your Majesty, as a conspiracy against the authority with which you have been invested. Surely every unbiased observer will readily admit that we cherish in our hearts no such intention. Our sole aim is to advance the best interests of your government and people. I and my principal companions hold ourselves in readiness to leave for Tihran, that we may, in your presence as well as in that of our chief opponents, establish the soundness of our Cause." Not content with his own petition, he bade his leading supporters address similar appeals to the Shah and stress his request for justice. No sooner had the messenger who was carrying those petitions to Tihran set out on his way than he was seized and brought back into the presence of the governor. Infuriated by the action of his opponents, he ordered the messenger to be immediately put to death. He destroyed the petitions and in their stead wrote the Shah letters which he loaded with abuse and insult, and, adding the signatures of Hujjat and his chief companions, despatched them to Tihran. The Shah was so indignant after the perusal of these insolent petitions that he gave orders for the immediate despatch of two regiments equipped with guns and munitions to Zanjan, commanding that not one supporter of Hujjat be allowed to survive. The news of the Bab's martyrdom had meanwhile reached the hard-pressed occupants of the fort through Siyyid Hasan, brother of Siyyid Husayn, the Bab's amanuensis, who had arrived from Adhirbayjan on his way to Qazvin. The news spread among the enemy and was welcomed by them with shouts of wild delight. They hastened to ridicule and hurl their taunts at the efforts of His adherents. "For what reason," they cried in haughty scorn, "will you henceforth be willing to sacrifice yourselves? He in whose path you long to lay down your lives, has himself fallen a victim to the bullets of a triumphant foe. His body is even now lost both to his enemies and to his friends. Why persist in your stubbornness when a word is sufficient to deliver you from your woes?" However much they strove to shake the confidence of the bereaved community, they failed, in the end, to induce the feeblest among them either to desert the fort or to recant his Faith. The Amir-Nizam was meanwhile urging his sovereign to despatch further reinforcements to Zanjan. Muhammad Khan, the Amir-Tuman, at the head of five regiments and equipped with a considerable amount of arms and munitions, was finally commissioned to demolish the fort and wipe out its occupants. had told him, "refuse to entertain my appeal, I am willing, with its permission, to depart with my family to a place beyond the confines of this land. Should it refuse to grant even this request and persist in attacking us, we should feel constrained to arise and defend ourselves." Aziz Khan assured Siyyid Ali Khan that he would do all in his power to induce the authorities to effect a speedy solution of this problem. No sooner had Siyyid Ali Khan retired than Aziz Khan was surprised by the farrash(1) of the Amir-Nizam, who had come to arrest Siyyid Ali Khan and to conduct him to the capital. He was seized with great fear and, in order to avert any suspicion from himself, began to abuse Hujjat and to denounce him openly before the farrash. By this means he was able to ward off the danger that threatened his own life. wounded his steed. The enemy was meanwhile directing, with unrelenting fury, its fire upon the fort, and had succeeded in killing a large number of its occupants. As the days-went by; it became increasingly evident that the forces under the command of the Amir-Tuman, in spite of their great superiority in number, equipment, and training, were unable to achieve the victory they had fondly anticipated. The death of Farrukh Khan, son of Yahya Khan and brother of Haji Sulayman Khan, one of the generals of the enemy's army, aroused the indignation of the Amir-Nizam, who addressed a strongly worded communication to the commanding officer, reprimanding him for his failure to force the besieged to an unconditional surrender. "You have sullied the fair name of our country," he wrote him, "have demoralised the army, and have wasted the lives of its ablest officers." He was bidden enforce the strictest discipline among his subordinates and cleanse his camp from every stain of debauchery and vice. He was, moreover, urged to take counsel with the chiefs of the people of Zanjan, and was warned that, failing to achieve his end, he would be degraded from his position. "If your combined endeavours," he added, "prove powerless to force their submission, I myself will proceed to Zanjan, and will order a wholesale massacre of its inhabitants, irrespective of their position or belief. A town that can bring so much humiliation to the Shah and distress to his people is utterly unworthy of the clemency of our sovereign." been experienced. The flower of Hujjat's supporters fell on that day, victims to a ruthless carnage. Many a son was butchered in circumstances of unbridled cruelty under the eyes of his mother, while sisters gazed with horror and anguish upon the heads of their brothers raised on spears and brutally disfigured by the weapons of their foes. In the midst of a tumult in which the boisterous enthusiasm of the companions of Hujjat faced the fury and barbarism of an exasperated enemy, the voices of women, who were struggling side by side with the men, could be heard from time to time, animating the zeal of their fellow-disciples. The victory that was miraculously achieved on that day was, in no small measure, attributable to the shouts of exultation which those women raised in the face of a mighty foe, shouts which acquired added poignancy by their own acts of heroism and self-sacrifice. Disguised in the garb of men, some had rushed forward, in their eagerness to supplant their fallen brethren, while the rest were seen carrying on their shoulders skins full of water, with which they strove to allay the thirst, and revive the strength, of the wounded. Confusion reigned meanwhile in the camp of the enemy. Deprived of water, and distressed by defection in their ranks, they fought a losing battle, unable to retreat and impotent to conquer. No less than three hundred companions quaffed, that day, the cup of martyrdom. and uprightness of Hujjat and his companions. "Day and night," he complained, "I strive through my public discourse, no less than by private converse with the people, to instil into their minds the conviction that that wretched band is the sworn enemy of the Prophet and the wrecker of His Faith. The cry of that evil man, Muhsin, robs my words of their influence and nullifies my exertions. To exterminate that miserable wretch is surely your first obligation." The Amir promptly ordered a number of his men, who were famed for their marksmanship, to lie in wait for Muhsin and shoot him when in the act of prayer. It was the hour of dawn when, as he raised the cry of "La Ilah-a-Illa'llah,"(2) a bullet struck him in the mouth and killed him instantly. Hujjat, as soon as he was informed of that cruel act, ordered another of his companions to ascend the turret and continue the prayer from where Muhsin had left off. Though his life was spared until the cessation of hostilities, he, together with certain of his brethren, was made to suffer, eventually, a death no less atrocious than that of his fellow-disciple. intermingled with the terrors and hardships of a long-protracted siege. How often did the clamour of an advancing foe drown the acclamations of joy with which bride and bridegroom greeted each other! How suddenly was the voice of merriment stilled by the cry of "Ya Sahibu'z-Zaman!" that summoned the faithful to arise and repulse the invader! With what tenderness would the bride entreat the bridegroom to tarry awhile longer beside her ere he rushed forth to win the crown of martyrdom! "I can spare no time," he would reply. "I must hasten to obtain the crown of glory. We shall surely meet again on the shores of the great Beyond, the home of a blissful and eternal reunion." No less than two hundred youths were joined in wedlock during those tumultuous days. Some a month, others a few days, and still others for but a brief moment, were able to tarry undisturbed in the company of their brides; no one among them failed, as the beating of the drum announced the hour of his departure, to respond joyously to the call. Each and every one ungrudgingly offered himself as a sacrifice for his true Beloved; all drank, eventually, the cup of martyrdom. No wonder the spot that has been the theatre of untold sufferings and has witnessed such heroism has been named Ard-i-A'la(1) by the Bab, a title that has remained for all time linked with His own blessed name. glows in my heart." The praise of his Beloved lingered on his lips until the last moment of his life. the day of your birth, while besieged in the fort of Ali-Mardan Khan. I rejoice that you, the only son whom God gave me, have enabled me to redeem that pledge." My pen is powerless to portray, much less to render befitting tribute to, the consuming enthusiasm that glowed in those valiant hearts. Violent as were the winds of adversity they were powerless to quench its flame. Men and women laboured with unabating fervour to strengthen the defences of the fort and reconstruct whatever the enemy had demolished. What leisure they could obtain was consecrated to prayer. I very thought, every desire, was subordinated to the paramount necessity of guarding their stronghold against the onslaughts of the assailant. The part the women played in these operations was no less arduous than that accomplished by their men companions. Every woman, irrespective of rank and age, joined with energy in the common task. They sewed the garments, baked the bread, ministered to the sick and wounded, repaired the barricades, cleared away from the courts and terraces the balls and missiles fired upon them by the enemy, and, last but not least, cheered the faint in heart and animated the faith of the wavering. (1) Even the children joined in giving whatever assistance was in their power to the common cause, and seemed to be fired by an enthusiasm no less remarkable than that which their fathers and mothers displayed. Such was the spirit of solidarity that characterised their labours, and such the heroism of their acts, that the enemy was led to believe their number was no less than ten thousand. It was generally conceded that a continual supply of provisions found its way, in an unaccountable manner, to the fort, and that fresh reinforcements were being steadily despatched from Nayriz, from Khurasan, and from Tabriz. The power of the besieged seemed to them as unshakable as ever, their resources inexhaustible. and spurred by the rebukes and protestations of the authorities in Tihran, determined to resort to the abject weapons of treachery in order to exact the complete submission of the besieged. (1) Firmly convinced of the futility of his efforts to face his opponents in the field honourably, he craftily called for the suspension of hostilities, and gave currency to the report that the Shah had decided to abandon the whole enterprise. He represented his sovereign as having, from the very beginning, discountenanced the idea of extending his support to the forces that fought in Mazindaran and Nayriz, and of having deplored the shedding of so much blood for so insignificant a cause. The people of Zanjan and the surrounding villages were led to believe that Nasiri'd-Din Shah had actually ordered the Amir-Tuman to negotiate a friendly settlement of the issues between him and Hujjat, and that it was his intention to put an end, as speedily as possible, to this unhappy state of affairs. Assured that the people had been deceived by his cunning plot, he drew up an appeal for peace, in which he assured Hujjat of the sincerity of his intention of achieving a lasting settlement between him and his supporters. He accompanied that declaration with a sealed copy of the Qur'an, as a testimony of the sacredness of his pledge. "My sovereign," he added, "has forgiven you. You, as well as your followers, I hereby solemnly declare to be under the protection of his Imperial Majesty. This Book of God is my witness that if any of you decide to come out of the fort, you will be safe from any danger." are still vivid in our minds. That which was perpetrated against them, the same they purpose to perpetrate against us. In deference to the Qur'an, however, we shall respond to their invitation, and shall despatch to their camp a number of our companions, that thereby their deceitfulness may be exposed." I have heard Ustad Mihr-'Aliy-i-Haddad, who survived the massacre of Zanjan, relate the following: "I was one of the nine children, none of whom were more than ten years old, who accompanied the delegation sent by Hujjat to the Amir-Tuman. The rest were men of over eighty years of age. Among them were Karbila'i Mawla-Quli-Aqa-Dadash, Darvish-Salah, Muhammad-Rahim, and Muhammad. Darvish-Salah was a most impressive figure, tall of stature, white-bearded, and of singular beauty. He was greatly esteemed for his honourable and just conduct. His intervention on behalf of the downtrodden invariably received the consideration and sympathy of the authorities concerned. He renounced, after his conversion, all the honours he had received, and, though far advanced in age, enrolled himself among the defenders of the fort. He marched before us carrying the sealed Qur'an as we were led into the presence of the Amir-Tuman. "The Amir-Tuman, in a burst of fury, offered that Darvish-Salah's beard be torn out, and that he, with those who were with him, be thrown into a dungeon. I and the rest of the children were scared, and attempted to escape. Raising the cry of `Ya Sahibu'z-Zaman!' we hurried in the direction of our barricades. Some of us were overtaken and made prisoners. As I was fleeing, the man who was pursuing me laid hold of the hem of my garment. I tore myself away from him and managed to reach the gate that led to the approaches of the fort, in a state of utter exhaustion. How great was my surprise when I saw one of the companions, a man named Iman-Quli, being savagely mutilated by the enemy. I was horrified as I gazed upon that scene, knowing as I did that on that very day the cessation of hostilities had been proclaimed and the most solemn pledges given that no acts of violence would be committed. I was soon informed that the victim had been betrayed by his brother, who, on the pretext of desiring to speak with him, had handed him over to his persecutors. Seating himself in the centre of the maydan,(3) Hujjat summoned his followers. On their arrival, he arose and, standing erect in their midst, spoke to them in these words: "I am well pleased with your unflinching endeavours, my beloved companions. Our enemies are bent upon our destruction. They harbour no other desire. Their intention was to trick you into coming out of the fort, and then to slaughter you mercilessly after their hearts' desire. Finding that their treachery has been exposed, they have, in the fury of their rage, ill-treated and imprisoned the oldest and the youngest among you. It is clear that not until they capture this fort and scatter you, will they lay down their arms or cease their persecutions against us. Your continued presence in this fort will eventually cause you to be taken captive by the enemy, who will of a certainty dishonour your wives and slay your children. Better is it, therefore, for you to make your escape in the middle of the night and to take your wives and children with you. Let each one seek a place of safety until such time as this tyranny shall be overpast. I shall remain alone to face the enemy. It were better that my death should allay their thirst for revenge than that you should all perish." neither are our families of a more noble descent than that of your kinsmen. Whatever calamity may yet befall you, is what we shall welcome for ourselves." All except a few remained true their pledge. These, unable to bear the ever-increasing distress of a prolonged siege, and encouraged by the advice Hujjat himself had given them, betook themselves to a place of safety outside the fort, thus separating themselves from the rest of their fellow-disciples. Nerved to a resolve of despair, the Amir-Tuman ordered all able-bodied men in Zanjan to assemble in the neighbourhood of his camp, ready to receive his commands. He reorganised the forces of his regiments, appointed their officers, and added them to the host of fresh recruits that had massed in the town. He ordered no less than sixteen regiments, each equipped with ten guns, to march against the fort. Eight of these regiments were charged to attack the fort every forenoon, after which the remainder of the forces were to replace them in their offensive until the approach of evening. The Amir himself took the field, and was seen in the forenoon of every day directing the efforts of his host, assuring them of the reward awaiting their success, and warning them of the punishment which, in the event of defeat, the sovereign would inflict upon them. the fort. A tremendous bombardment threatened the structure with immediate destruction. It lasted for a number of days, during which the stronghold stood firm in spite of the increasing fire which was directed against it. The friends of Hujjat displayed, during those days, a valour and skill that even their bitterest foes were compelled to admire. One day, while the bombardment was still in progress, a bullet struck Hujjat in the right arm, as he was performing his ablutions. Though he ordered his servant not to inform his wife of the wound he had received, yet such was the man's grief that he was powerless to conceal his emotion. His tears betrayed his distress, and no sooner had the wife of Hujjat learned of the injury inflicted on her husband than she ran in distress and found him absorbed in prayer in a state of unruffled calm. Though bleeding profusely from his wound, his face retained its expression of undisturbed confidence. "Pardon this people, O God," he was heard to say, "for they know not what they do. Have mercy upon them, for they who have led them astray are alone responsible for the misdeeds the hands of this people have wrought." Hujjat sought to calm the agitation that had seized his wife and relatives at the sight of the blood that covered his body. "Rejoice," he told them, "for I am still with you and desire you to be wholly resigned to God's will. What you now behold is but a drop compared to the ocean of afflictions that will be poured forth at the hour of my death. Whatever be His decree, it is our duty to acquiesce and bow down to His will." possessions. Despite the severity of that winter, these captives were left exposed in the open for no less than fifteen days and nights to a biting cold such as Zanjan had rarely experienced. Clad in the thinnest of garments, with no covering to protect them, they were abandoned, without food and shelter, in the wilderness. Their only protection was the gauze that covered their heads, with which they sought in vain to shield their faces from the icy wind that blew mercilessly upon them. Crowds of women, most of whom were inferior to them in social position, flocked from the various quarters of Zanjan to the scene of their sufferings and poured upon them contempt and ridicule. "You have now found your god," they scornfully exclaimed, as they danced wildly around them, "and have been rewarded abundantly by him." They spat in their faces and heaped upon them the foulest invectives. The capture of the fort, though robbing Hujjat's companions of their chief instrument of defence, failed either to daunt their spirit or discourage their efforts. All property on which the enemy could lay its hands was plundered, and the women and children who were left defenceless were made captives. The rest of the companions, together with the remaining women and children, crowded into the houses that lay in the close vicinity of Hujjat's residence. They were divided into five companies, each consisting of nineteen times nineteen companions. From each of these companies, nineteen would rush forth together and, raising with one voice the cry of "Ya Sahibu'z-Zaman!" would fling themselves into the midst of the enemy and would succeed in scattering its forces. The uplifted voices of these ninety-five companions would alone prove sufficient to paralyse the efforts, and crush the spirit, of their assailants. was himself weary of the coercive measures to which he had been compelled to resort in order to maintain the discipline of his men and to keep unimpaired their efficiency and vigour. He was drive against to take counsel with the remainder of his officers, and to seek a desperate remedy for a situation that was fraught with grave danger to his own life no less than to that of the inhabitants of Zanjan. "I am weary," he confessed, "of the grim resistance of this people. They are evidently animated by a spirit which no amount of encouragement from our sovereign can hope to call forth in our men. Such self-renunciation surely no one in the ranks of our army is able to manifest. No power that I can command is able to arouse my men from the slough of despair into which they have fallen. Whether they triumph or fail, these soldiers believe themselves doomed to eternal damnation." dig out underground passages from the site which their camp occupied to a place underneath the quarter in which the dwellings of Hujjat's adherents were situated. They determined to blow up these houses and by this means to force them to an unconditional surrender. For one whole month they laboured to fill these underground passages with all manner of explosives, and continued, at the same time, to demolish with fiendish cruelty such houses as remained standing. 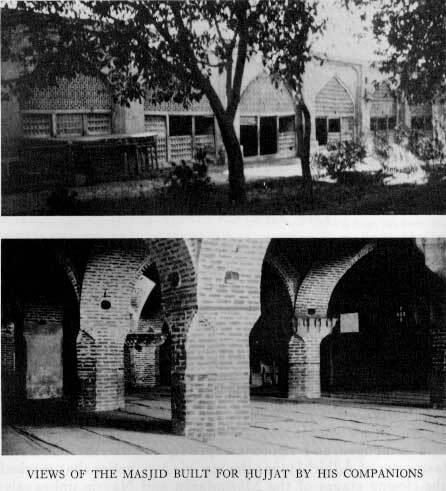 Wishing to accelerate the work of destruction, the Amir-Tuman ordered the officers in charge of his artillery to direct their fire upon Hujjat's residence, as the buildings that intervened between that house and the camp of the enemy had been razed to the ground, there remaining no further obstacle in the way of its ultimate destruction. 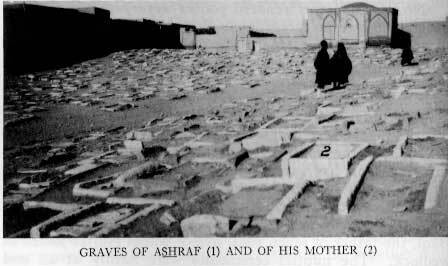 A section of his dwelling had already collapsed when Hujjat, who was still living within its walls, turned to his wife Khadijih, who was holding Hadi, their baby, in her arms, and warned her that the day was fast approaching when she and her infant might be taken captive, and bade her be prepared for that day. She was giving vent to her distress when a cannon-ball struck the room which she occupied, and killed her instantly. Her child, whom she was holding to her breast, fell into the brazier beside her, and shortly afterwards died of the injuries he had received, in the house of Mirza Abu'l-Qasim, the mujtahid of Zanjan. Hujjat, though filled with grief, refused to yield to idle sorrow. "The day whereon I found Thy beloved One, O my God," he cried, "and recognised in Him the Manifestation of Thy eternal Spirit, I foresaw the woes that I should suffer for Thee. Great as have been until now my sorrows, they can never compare with the agonies that I would willingly suffer in Thy name. How can this miserable life of mine, the loss of my wife and of my child, and the sacrifice of the band of my kindred and companions, compare with the blessings which the recognition of Thy Manifestation has bestowed on me! Would that a myriad lives were mine, would that I possessed the riches of the whole earth and its glory, that I might resign them all freely and joyously in Thy path." of Hujjat, and filled them with burning indignation. They determined to make a last and desperate effort to avenge the blood of their slaughtered brethren. Hujjat, however, dissuaded them from making that attempt, and exhorted them not to hasten the issue of the conflict. He bade them resign themselves to the will of God and to remain calm and steadfast to the end, whenever that end might come. As time went on, their number diminished, their sufferings multiplied, and the area within which they could feel secure was reduced. On the morning of the fifth of the month of Rabi'u'l-Avval, in the year 1267 A.H.,(1) Hujjat, who had already, for nineteen days, endured the severe pain caused by his wound, was in the act of prayer and had fallen prostrate upon his face, invoking the name of the Bab, when he suddenly passed away. His sudden death came as a severe shock to his kindred and companions. Their grief at the passing of so able, so accomplished, and so inspiring a leader, was profound; the loss was irreparable. Two of his companions, Din-Muhammad-Vazir and Mir Riday-i-Sardar, straightway undertook, ere the enemy was made aware of his death, to inter his remains in a place which neither his kindred nor his friends could suspect. At midnight the body was borne to a room that belonged to Din-Muhammad-Vazir, where it received burial. They demolished that room in order to ensure the safety of the remains from desecration, and exercised the utmost care to maintain the secrecy of the spot. More than five hundred women who survived that terrible tragedy were, immediately after the death of Hujjat, gathered together in his house. His companions, in spite of the death of their leader, continued to face, with undiminished zeal, the forces of their assailants. Of the great multitude that had flocked to the standard of Hujjat, there remained only two hundred vigorous men; the rest either had died or were utterly incapacitated by the wounds they had received. out what still remained of the formidable forces they had been unable to subdue. They launched a general attack, fiercer and more determined than any previous one. Animated by the beating of drums and the sound of trumpets, and encouraged by the shouts of exultation raised by the populace, they threw themselves upon the companions with unbridled ferocity, resolved not to rest until the whole company had been annihilated. In the face of this fierce onset, the companions raised once more the cry of Ya Sahibu'z-Zaman!" and rushed forth, undismayed, to continue the heroic struggle until all of them had been either slain or captured. That massacre had scarcely been perpetrated when the signal was given for a pillage, unexampled in its scope and ferocity. Had not the Amir-Tuman issued orders to spare what remained of the house and belongings of Hujjat, and to refrain from any acts of violence against his kindred, even more dastardly attacks would have been made by his rapacious army. His intention was to inform the authorities in Tihran and to seek from them whatever advice they wished to give him. He failed, however, to restrain indefinitely the spirit of violence which animated his men. 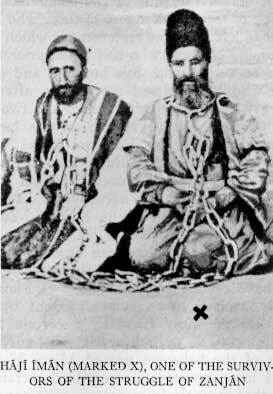 The ulamas of Zanjan, flushed with the victory that had cost them such exertion and loss of life, and which had involved to such an unprecedented degree their reputation and prestige, endeavoured to incite the populace to commit every imaginable outrage against the lives of their men captives and the honour of their women. The sentinels who guarded the entrance to the house in which Hujjat had been living, were driven from their posts in the general tumult that ensued. The populace joined hands with the army to plunder the property and assail the persons of the few who still survived that memorable struggle. Neither the Amir-Tuman nor the governor was able to allay the thirst for plunder and revenge which had seized the whole town. Order and discipline no longer existed in the midst of the general confusion. The governor of the province was, however, able to induce the officers of the army to gather together the captives into the house of a certain Haji Ghulam and to keep them in custody until the arrival of fresh instructions from Tihran. The entire company were huddled together like sheep in that wretched place, exposed to the cold of a severe winter. The enclosure into which they were crowded was roofless and without furniture. For a few days they remained without food. From thence the women were removed to the house of a muJtahid named Mirza Abu'l-Qasim, in the hope that he would induce them to recant, in return for which they would be offered their freedom. The greedy mujtahid, however, had, with the aid of his wives, his sisters and daughters, succeeded in seizing all they had been allowed to carry with them; had stripped them of their garments, clothed them in the meanest attire, and appropriated for himself whatever valuables he could find among their belongings. After suffering untold hardships, these women captives were allowed to join their relatives, on condition that these would undertake full responsibility for their future behaviour. The rest were dispersed throughout the neighbouring villages, the inhabitants of which, unlike the people of Zanjan, welcomed the newcomers with treatment that was at once affectionate and genuine. The family of Hujjat, however, was detained in Zanjan until the arrival of definite instructions from Tihran. As to the wounded, they were placed in custody until such time as the authorities in the capital should send directions as to how they were to be treated. Meanwhile the severity of the cold to which they were exposed and the cruelties they underwent were such that within a few days they had all perished. has deceived us! With devilish persistence he sought to convince us of this people's disloyalty to the Imam Ali and to his kindred. Never, though we all be slain, will we consent to assist in such criminal deeds." of the privations he and his family were made to suffer, and was buried in the very midst of the ruins that had served as his shelter. I was privileged, nine years after the termination of that memorable struggle, to visit Zanjan and witness the scene of those terrible butcheries. I beheld with grief and horror the ruins of the fort of Ali-Mardan Khan, and trod the ground that had been saturated with the blood of its immortal de- fenders. I could discern on its gates and walls traces of the carnage that marked its surrender to the enemy, and could discover upon the very stones that had served as barricades, stains of the blood that had been so profusely shed in that neighbourhood. so prolonged the siege which they withstood, that to ascertain their names and number would be a task that I would hesitate to undertake. A tentative list of such names, which readers might do well to consult, has been prepared by Ismu'llahu'l-Mim and Ismu'llahu'l-Asad. Many and conflicting are the reports as to the exact number of those who struggled and fell under the banner of Hujjat in Zanjan. Some have estimated that there were as many as a thousand martyrs; according to others, they were more numerous. I have heard it stated that one of the companions of Hujjat who undertook to record the names of those who had suffered martyrdom, had left a written statement in which he had computed the number of those who had fallen prior to the death of Hujjat to be a thousand, five hundred and ninety-eight, whilst those who had suffered martyrdom afterwards were thought to have been in all two hundred and two persons. For the account I have related of the happenings of Zanjan I am primarily indebted to Mirza Muhammad Aliy-i-Tabib-i-Zanjani, to Aba-Basir, and to Siyyid Ashraf, all martyrs of the Faith, with each of whom I was closely acquainted. The rest of my narrative is based upon the manuscript which a certain Mulla Husayn-i-Zanjani wrote and sent to the presence of Baha'u'llah, in which he recorded all the information he could glean from different sources regarding the events connected with that episode. What I have related of the struggle of Mazindaran has been similarly inspired, to a very great extent, by the written account sent to the Holy Land by a certain Siyyid Abu-Talib-i-Shahmirzadi, as well as by the brief survey prepared here by one of the believers named Mirza Haydar-'Aliy-i-Ardistani. I have, moreover, ascertained certain facts connected with that struggle from persons who actually participated in it, such as Mulla Muhammad-Sadiq-i-Muqaddas, Mulla Mirza Muhammad-i-Furughi, and Haji Abdu'l-Majid, father of Badi' and martyr to the Faith. could gather from the detailed account sent to the Holy Land by a believer of that town, named Mulla Shafi, who had carefully investigated the matter and had reported it to Baha'u'llah. Whatever my pen has failed to record, future generations will, I hope, gather together and preserve for posterity. Many, I confess, are the gaps in this narrative, for which I beg the indulgence of my readers. It is my earnest hope that these gaps may be filled by those who will, after me, arise to compile an exhaustive and befitting account of these stirring events, the significance of which we can as yet but dimly discern.